Although I can remember countless hours of playing in the snow as a child, as an adult, I'm not really much for the cold. I don't mind the snow, so long as I can stay inside and watch it with a nice mug of hot chocolate. 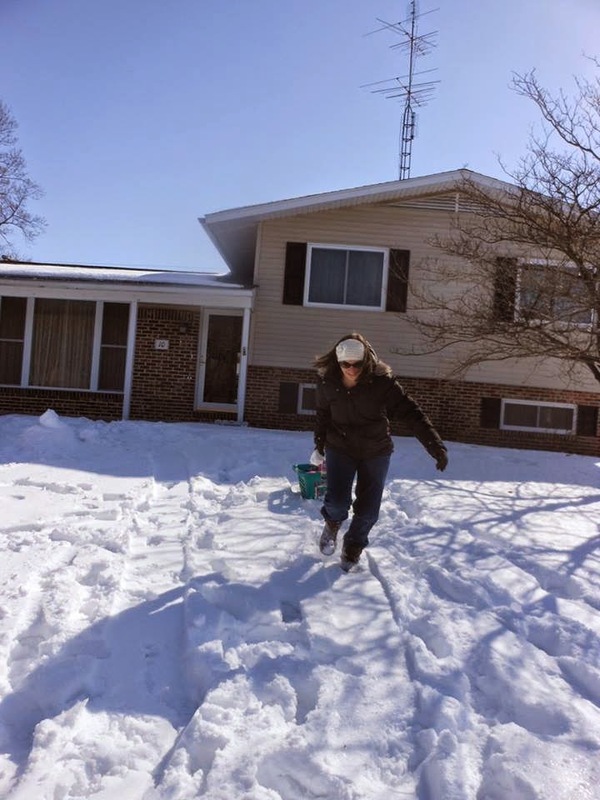 That being said, we also want Grace to have as many life experiences as possible, and building a snowman and sledding are just things that all kids should have a chance to do. It's hard sometimes, because Grace can't beg and beg to play in the snow, so I have to talk myself into suiting up to go outside in the cold. 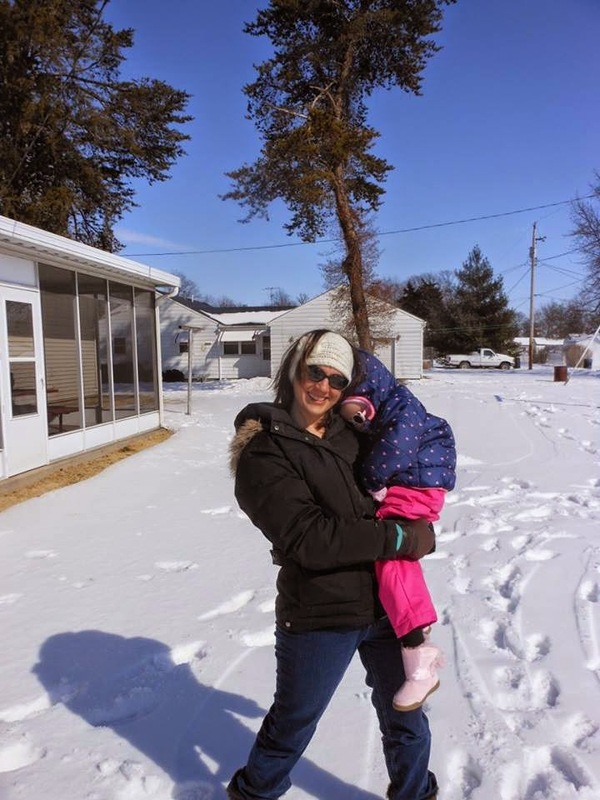 It might be the fact that it takes almost as long to put on Grace's snow pants, her coat, mittens, hat and boots, as we spend in the snow. But I have to say for the couple of days we played outside this week, it was worth it. 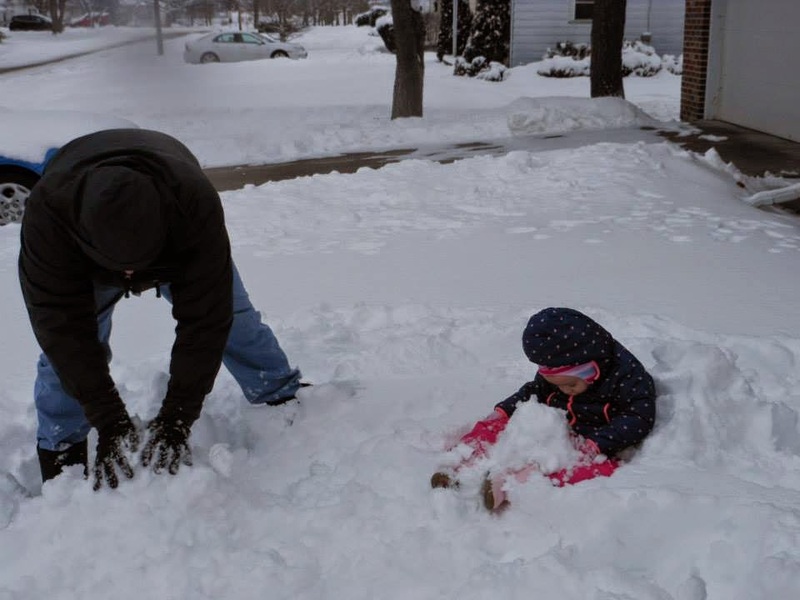 Grace and her daddy building their snowmen. On Sunday, we opted for building a snowman. Church was cancelled because of the weather, so we bundled up and headed out after finishing our lunch. 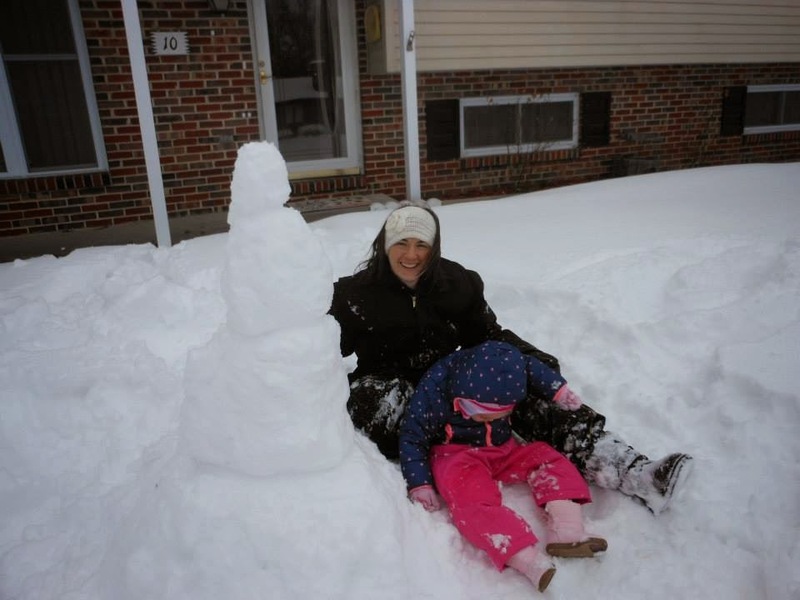 We set Grace in the 12-inches of snow in our front yard, and kind of packed it up around her so she wouldn't fall over. 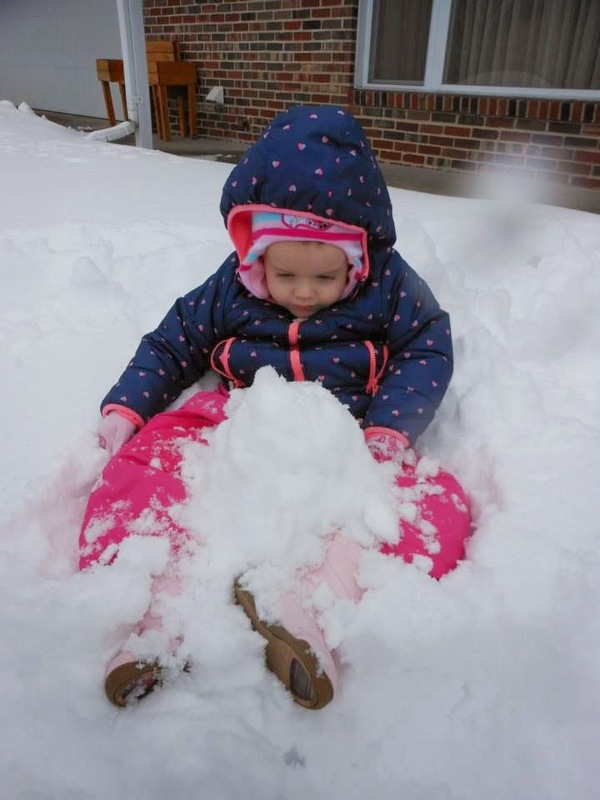 We piled up some snow in front of her and let her play with it, while we worked on a snowman. It wasn't the fanciest snowman in the neighborhood, but we were pretty proud of our efforts. So, after we warmed up, we headed back outside again on Friday afternoon. Grace didn't have physical therapy in Springfield, so we enjoyed a rare day at home together. Daddy takes a turn pulling Grace in her sled. Today, we decided we would try sledding. 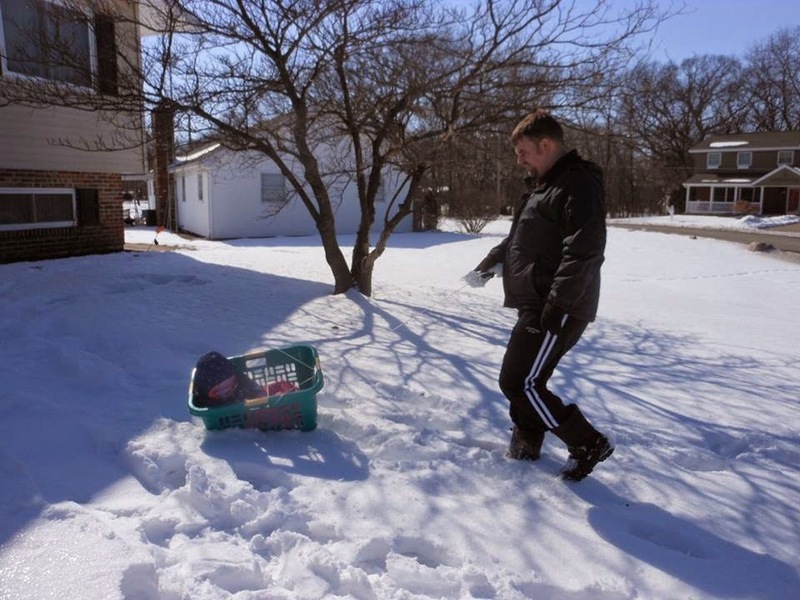 The one problem was that we don't actually own a sled. And let's just say it's hard to find one in stores in March! So, I was wandering around Dollar General, trying to figure out something that would work, and thought about using a laundry basket with some rope to pull it. I bought the rope, but we settled on a laundry basket at home. 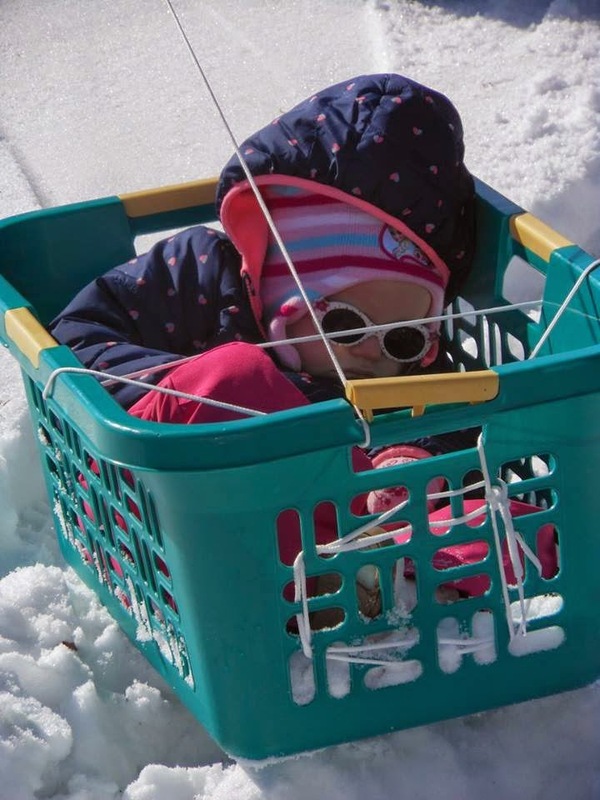 It actually worked out much better because we discovered Grace would have had trouble staying on a regular sled, but was safe and sound in the basket. Mommy liked pulling Grace too. It took a few adjustments before we figured out how to pull her in it without tipping over, but once we did, we had a lot of fun pulling her around our yard. There weren't any giggles of joy or squeals of laughter, but she did have lots of smiles as we pulled her through the snow. And it was definitely a good workout for us! Grace have decided not to take a nap today, but I sure could have used one! It might not be the most conventional sled, but it worked! Our last winter experience was actually one we did with her during her first snow, making a snow angel. I think it was one of her favorite parts because she giggled as I moved her legs to make the bottom and her arms for the wings. Making a beautiful snow angel. I have to admit that I'm really glad that spring is just around the corner. I much prefer taking Grace on walks and pushing her in the swing, but every once in awhile, winter proves it can be "snow much fun." It looks like you had a wonderful time, all of you. I'm with you though, I prefer warmer weather. We had great weather this past weekend and it was great to be spoiled. Just think of all the things to do in spring and summer. Kisses, hugs, and prayers for Gracie and her family.